Preparing for the holiday season? Check out these tipping guidelines so you know what kind of gratuity you should give to the important people in your life. Each year as the holiday season approaches, so does the holiday tipping season. For some of us, this can cause a lot of pressure, anxiety, and sleepless nights as we wonder who we should tip and how much should we tip when it comes to showing our appreciation to the people who have provided services to us all throughout the year. Here are some questions that can help you decide who you will tip, followed by possible solutions if you feel that you cannot afford holiday tipping this year. Do you tip the person each time they provide the service to you during the year? If your answer is yes, then you do not have to give them a holiday tip; however, you may want to give them a small gift as an overall gesture of thanks. Does the same person normally provide the service? If you answer yes, then you will want to include them on your holiday tip list. If different people show up to provide the service, then you can probably feel safe to skip the tip. What is your relationship like with the person? Do you see the person regularly? Have they provided the service to you for years? If so, you will want to include them on your holiday tip list. If you wouldn't recognize the person if you saw them at the grocery store (assuming that you are good with remembering faces) then you could skip the tip, but still give them a small gift. Are you satisfied with the person's services? Are they friendly and accommodating? There is no law that says that you must tip someone who provides poor service or who you feel has been rude and inflexible. However, remember that holiday tipping is not about giving performance reviews. It should be a sincere gesture of thanks from you to someone who has really given you a hand during the year. Do you live in a major city or small town? Another factor to consider is where you live. If you live in a large city, you are probably looking at tipping more people and giving higher dollar tips, then someone living in a small city or town. Also, pay attention to what the normal customs are in your area in regards to holiday tipping. Do any of the service people on your list also own the business? 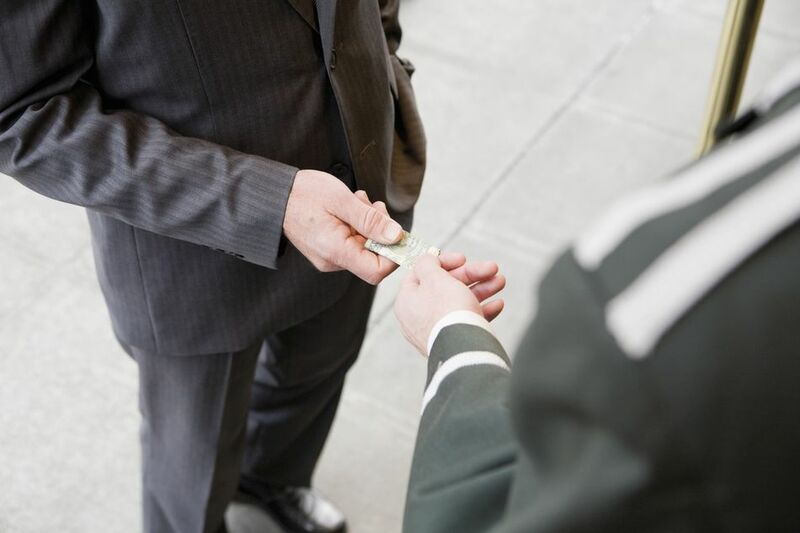 Generally, it is not necessary to tip the owner of a business, even when they provide the service. But if it someone who works independently like a free agent, and doesn't really own a business, but also doesn't work for anyone, then you will probably want to give them a tip. Skip tipping any of the professional people in your life, including your doctor, dentist, lawyer, banker or accountant. Do not do it, even if the person went beyond the call of duty on your behalf. But do take a moment to send them a nice holiday card, with a thoughtful hand-written note of thanks from you. Can't Afford to Tip? Are You Sure? Theoretically, if you can afford to use the services a person provides to you all year, then it is considered good manners to give them a holiday tip. But if for some reason December rolls around and you do not have it in your budget to tip everyone, there are some other options that may help you get through the season without insulting the service folks who have just spent the past year making your life easier. Consider giving homemade gifts like a special type of cookie that you know how to make. Put a lot of thought into presentation. If it will be wrapped, use a lot of gift wrap and ribbons. Gift cards to coffee shops, ice cream parlors, or restaurants known for having delicious desserts are almost always appreciated. Gift cards for online music or ebooks also make a nice gift. Put thought into who the gift is for, then match up an inexpensive gift card that they will use. However, be sure that the amount of the gift card will fully cover the cost of some of the items on the menu, or in the store. For teachers and even the babysitter, watch the sales and try to get something inexpensive and comfy for them. Does your babysitter like hair accessories? Pick out a really nice one, then wrap it up in a beautiful package. If you try hard to find an inexpensive gift that matches up to something that you know the person likes, then regardless of its value, it will likely be appreciated. There are people who do not believe in holiday tipping or tipping during any time of the year. Of course, that is their right, but you won't hear me defending it. In the U.S., not tipping is considered bad manners and people who have bad manners tend to make the rest of us uncomfortable. Put tips inside of holiday cards and then inside of an envelope. Write a personal note on the card, thanking them for their hard work. Don't allow your child to hand over the holiday tip. It is demeaning to the person receiving it. Take my word for it. When giving gift cards to restaurants or retail stores, make sure that the amount of the gift card is enough to cover a complete meal for two, or that it covers the average price of the products sold at the store. If you are planning on giving wine or alcoholic beverages, know if the person drinks and if they do, try to get what they like. For example, if they love red wine, wouldn't it be a shame to show up with a bottle of white wine? The best time to give a holiday tip is before the season really kicks off, but if money is tight and you are having to juggle your funds, I've heard service people say they receive tips all the way through February. If you can't afford to tip everyone that you would like to tip, don't let it ruin your holiday season. There are some people who never give holiday tips. Be grateful that you are not them, and go enjoy yourself. Holiday Gift or Gratuity and How Much? The following pages cover tipping and gifting suggestions for various in-home service workers, outdoor workers, teachers, tutors, coaches, garbage collectors, mail carriers, pet care workers and many more. How Much Should You Tip the Nanny, Babysitter, Daycare Providers? Depending on how many children you have and their ages, holiday tipping (or giving a bonus) to all of the childcare providers that cross their paths can really add up. The good news is that it may not be necessary to give a monetary gift to everyone. Childcare providers include the au pair, nanny, babysitter, daycare employees, bus drivers, teachers, coaches, trainers, ballet teachers, music teacher or any other specialized trainer or teacher and tutors. We divided the list into two pages. The first page covers the au pair, nanny, babysitter, and daycare employees. The next page covers the teachers, coaches, trainers, ballet teachers, music teacher or any other specialized trainer or teacher and bus drivers. Rather than calling it a tip, the year-end monetary gift to the nanny is usually referred to as a bonus. The average amount to give is one to two weeks' pay along with a gift from each child under their care. For each year of service that they have given, add more to the monetary gift. Giving the nanny a year-end gratuity is one that you do not want to skip. Failure to tip the nanny would likely result in hurt feelings, especially if they talk to other nannies who brag about their holiday bonuses. The only time you would not want to tip the nanny is if you have plans to let her go (soon) because of very poor service and even then you may want to give them a little something. Deciding on the customary tip for the babysitter depends on usage. If you use them on an average of once a month for four hours, then a year-end $40 gift would be appropriate. If they come every Saturday night for five hours, then tip them what would equal to one or two nights' pay. Finding a good babysitter can be challenging. If you have one, then let them know how much you appreciate them by giving them a generous year-end tip. Tipping the people working at your child's daycare center can be confusing. First, find out if tipping is permitted. If it is, then $40 is an average tip for your child's lead teacher. If you want to give all of the employees a gift, consider gift cards or put together a gift basket that they can all enjoy, but still tip the lead teacher. How Much Should You Tip Teachers, Coaches, Tutors, Trainers, and Bus Drivers? Tipping teachers is usually referred to as gifting rather than tipping since no real cash should ever be given in order to avoid it appearing as a bribe. In fact, some states forbid teachers from accepting a monetary gift. Most teachers will tell you that they do not expect holiday gifts; however, they do appreciate thank you notes from parents and they especially like letters from the children. Regardless, most parents who can afford it will give the teacher a gift. According to Consumer Reports, the average cost of the gift is around $20. Many teachers enjoy receiving gifts that the children have made or written themselves. They also appreciate receiving things that they can use in the classroom. And most of them will quietly admit that the best gift is one gift certificate that all of the parents contribute to, rather than a lot of small gifts. The gifts that many teachers admit that they get too many of include candles, soaps, plaques with inscribed quotes about teachers, apple paperclip dispensers, baked goods and dollar store items. Also, giving them a framed picture of your child is not a good idea. What Grade Do Parents Stop Gifting Teachers? There is no definitive answer to this question. Some of it depends on what kind of school it is -- public or private -- and if the child has one teacher or several. Most parents stop gifting public school teachers by around middle school or when the child has multiple teachers. Deciding on whether you want to tip the coaches, teachers, and tutors who work with your child outside of school depends a lot on how involved they are with your child. If you decide that you want to tip them, the average amount is $20. You may also decide to give them a gift instead of money; for example, a gift card from Starbucks if you know they enjoy coffee. If you do decide on giving them a gift, avoid the gifts that point to their profession, like a figurine of a coach blowing a whistle to your child's soccer coach. It will likely end up on the table at their next garage sale. Tipping the school bus driver is a nice gesture, but if money is tight, this is one of the tips you can skip. If you decide that you do want to give them a year-end tip, the average amount is $20. Parents that tip school bus drivers often stop doing it once their child enters high school. How Much Should You Tip the Live-In Help? This category includes butlers, nannies, personal chefs, and housekeepers. If you are fortunate enough to have live-in help, then you should be prepared to give generous year-end tips to all of them in the form of money and a personal gift. The customary amount is a tip equal to one week to one month of their salary, depending on how long they have been with you, and a personal gift that is valued to one-fourth to one-half of their weekly salary. Any amount less than that and you risk looking the proverbial ​Scrooge. How Much Should You Tip Your Housekeeper? Just how much should you tip your housekeeper? Let's think about that for a moment. This is the person that handles your dirty laundry, removes junk from around your house and cleans your toilet throughout an entire year. If they are good at what they do and they manage a smile while they do it, my advice is to tip them generously. According to most etiquette experts, the average tip should be equal to what you pay them for weekly services. If they come once a month, the tip should be equal to the monthly session. The longer that they have worked for you, the more they should be paid, either with money or if the form of money and a gift. That amount should continue to go up for each year of service that they provide. How Much Should You Tip the Yard Workers, Pool Cleaner, Exterminator? If a crew comes out and takes care of your lawn, cuts your hedges, cleans out the flower beds, plows the snow in the winter, and reworks your flower beds in the spring and you are satisfied with their performance, consider yourself very fortunate. The average tip is $20-$40 per worker and $50 for the supervisor. If they really do a super job, you could dig a little deeper into your pocket or consider giving gift cards along with the tip. If you have one person that comes out and cuts your grass and does edging and blowing off debris six months out of the year, a $30 tip is fine. Tipping guidelines for pool cleaners is straightforward. The tip should be equal to one session and it can be divided up among the crew. Fortunately, most pool cleaners work alone or with skeleton crews, so getting a tip equal to their bill is pretty nice. Most exterminators get pretty surprised when they receive a holiday tip, but if the same person services your home on a regular basis, giving them a holiday tip is a nice gesture. The amount can be $10-$20 or even a gift card is acceptable. How Much Should You Tip the Mail Carrier and Newspaper Delivery Person? The policies surrounding tipping mail carriers has changed in recent years. Today, the U.S. Postal Service does not permit mail carriers to receive cash tips. It does allow them to receive gifts that are valued at $20 or less. The perfect gift for a mail carrier would be a non-refundable restaurant gift certificate or one to the local coffee shop. "Under these federal regulations, carriers are permitted to accept a gift worth $20 or less from a customer per occasion, such as Christmas. However, cash and cash equivalents, such as checks or gift cards that can be exchanged for cash, must never be accepted in any amount. Furthermore, no employee may accept more than $50 worth of gifts from any one customer in any one calendar year period." An appropriate amount to tip the newspaper delivery person is $50, which is close to one dollar a week. If you tip all year, giving them a homemade batch of cookies would be nice. How Much Should You Tip the Garbage Collector? The average holiday tip for garbage collectors is $20 a person. However, there are some considerations to ponder. You may live in a city where the trash collectors are city employees and cannot receive a tip. If they work for an independent company, the company may have a policy against tipping. Call and find out. Many times it is difficult to be there when the trash collectors come around. Depending on where you live, attaching a tip to the top of the trash can isn't feasible. Your best option is to mail a check to the employee at the address where they work. Today, many of the trash collectors just drive the truck, while a mechanical arm picks up the trash cans. If this is the case, giving a tip is not necessary. Many of the home health care companies have policies against accepting gifts or tips. Be sure to check with the company so that you do not put the worker in an uncomfortable or compromising position. If the company they work for does allow it, then the average amount of the tip should be one week's pay if they have been there a year or more and cut that amount in half if they have been there for less than a year. First, find out if they can accept tips. If so, one week's pay is customary, or a gift or both. If you have a loved one in a nursing home and you want to tip the people who care for her, a gift for all of the employees is appropriate. For example, you could send a fruit basket, dozens of pastries, or pizza coupons, along with a note thanking them for caring for your loved one. This category includes people who work as doormen, concierges, building superintendents, building handymen, elevator operators, security guards and parking garage attendants in residential buildings. Again, you have some things to consider when it comes to tipping the staff of people who work in the building where you reside. Deciding on whom to tip and who to skip, how much to tip, and when you should do is the root of a lot of anxiety over the holidays. So we are going to try to break it down some to help make your decisions easier. Would you consider your building small, average or large? The general rule of thumb is the smaller the building, the more each staff member will likely receive. If only one doorman at a time works and they also perform concierge services, you may want to look closer at the high end of the tip scale. If you live in a large building and they employ two doormen and a concierge, then you should look on the low end of the tip scale. Are You Satisfied With the Staff? When answering this question, think about the entire year. Make a note of the staff members who consistently did a good job and became your go-to people. Those are the people that you want to pay from the high-end of the scale. What about the creepy, rude employee who was unaccommodating? If you want to give them a tip to keep the peace, knock $10 off the low end of the scale, but be aware that building workers "talk among themselves," and under-tipping could cost you later if they show up to do work that in the past they would do for free, even though they could have charged you. If you give them too low of a tip, you can kiss all the free service goodbye. If you work from home and as a result, you receive more than the average amount of packages and visitors, you will want to consider this when deciding on how much to tip. Naturally, if you receive more services than the average resident, then you will want to tip accordingly. So Here it Goes - How Much Should You Tip? The Building Superintendent: The average tip is $50-$150, depending on how much you have needed them during the year. Adjust your tip based on his performance. Also, in high-end luxury buildings, the scale is more like $300-$500. Doormen: The average tip is $25-$50, but it can go as high as $1,000. It depends on how much your doorman works and how much service they offer. If they work an average 8-hour day and perform the basic doorman functions, you can look at the middle to low-end of the tip scale. Concierge: If the building provides doorman/concierge services such as wake-up calls, dinner reservations, walking your dog and package delivery, then you will want to look toward the high-end of the scale. Note: If there is more than one doorman, expect to tip each person. If you have a favorite, you can tip them more than the others. Not all tips have to be the same amount. If there is a doorman that recently started, you can tip them less. Handyman and Maintenance Workers: The average tip is $20-$50, with the $50 (or more) going to your go-to person that you noted above. For the rude and creepy workers, you can go as low as $10. That also goes for doormen. Garage Attendants: The average tip is $25-$75, but it can go as high as $300+ depending on where you live, the kind of car that you drive, and how often you come and go. Drive an expensive, luxury car? It goes up to the high end. Leave several times during the day? Look to the high end. Own a cheap car and live like a hermit? Look to the low end of the scale. When deciding on how much you should tip your barber, hair stylist or manicurist, you first want to determine if they are the owner of the business. If they are, then a tip is not necessary, but you might consider giving them a small gift as a gesture of goodwill and a note letting them know how much you appreciate their services. If you go to them monthly, then your tip should be equal to one session, plus a small gift. If you go to them three or four times a year, you can divide up one session by three or four to determine your tip; however, the very minimum that you should tip should not drop below $20. Plus, you may want to also include a small gift. If someone other than your hairstylist washes your hair on a regular basis, then the appropriate tip is any amount that you feel is deserving, over $10. How Much Should You Tip Your Personal Trainer and Massage Therapist? The answer to how much to tip your personal trainer and massage therapist is pretty straightforward. The customary tip for personal trainers is the amount equal to one session unless you have just started with them, at which point you can scale down the amount. Just don't let it go down so far that it becomes an insult instead of a gratuity. Determining the tip to give to massage therapist depends on how often you use their services. If you go weekly, then you may want to give the amount of at least two sessions or include a small gift with your tip. How Much Should You Tip Pet Groomers, Pet Sitters and Dog Walkers? If you use the services of pet groomers, pet sitters or a dog walker on a regular basis, it is customary to give them a holiday tip. Giving money or a gift is acceptable. Dog Groomer - Half of the cost of one session is acceptable. Pet Sitters - The amount of one week's worth of service is acceptable. Dog Walker - Like the pet sitters, the amount of one week's worth of service is acceptable.